In Windows 10 or Windows 8.1, the Start button may sometime appear to be not working properly, where you cannot click on it. In other words, Start button seems to freeze, not responding, and not clickable. You cannot also right click on Start button to open Quick Access menu. The error happens despite everything else on the Taskbar is working fine. The only alternative to bring up the Start menu or Start screen is by using Ctrl + Escape keyboard shortcut. Here’s a workaround to make the Start button works and responding again. Note that the trick do not actually fix the underlying issues, if any, related to Start button, but merely make it usable again without having to restart the device. Right click on Taskbar and open Task Manager, or alternatively press Ctrl + Shift + Escape keyboard shortcut. If you’re viewing the simple UI of Task Manager, click or tap on More details to expand the view. Then, go to Processes tab. Select Windows Explorer under “Windows processes” heading (if File Explorer is not running) or “Apps” heading (if File Explorer is running). 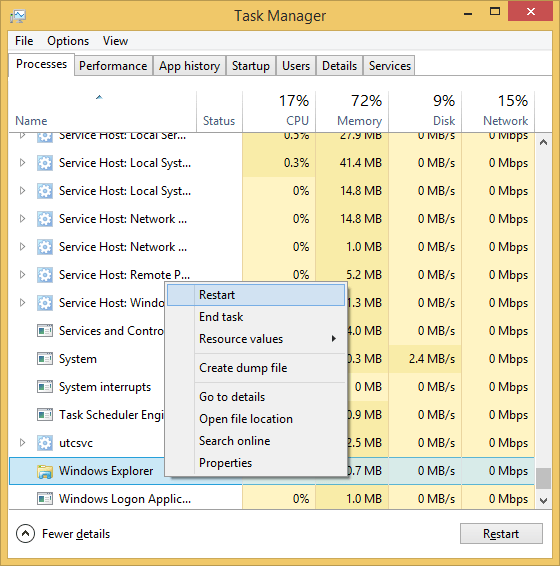 Hit Restart bottom on the bottom of Task Manager, or right click on Windows Explorer and select Restart. Close the Command Prompt when done.